Color(s): White, black, fawn, red; may be solid or of varying shades and markings. 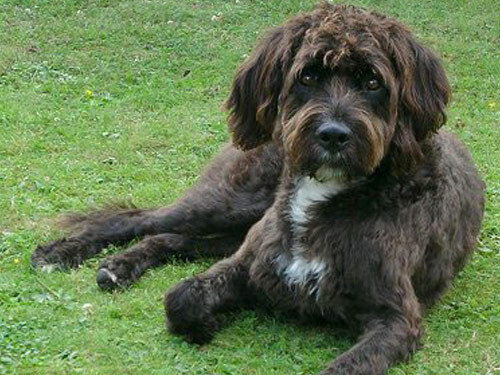 The Boxerdoodle is created by the crossing of two breeds: Boxer and Poodle. They are commonly referred to as a "designer dog". They have become popular companions, and may be potentially used for hunting. Well-built, strong, and agile, the Boxerdoodle is small to medium in size. They are well-muscled, possess a sweet expression, and are hardy in appearance. The Boxerdoodle is ideally an affectionate, loving, and loyal pet. They are playful, happy, and cheerful. They do best in a home with older, considerate children. Boxerdoodle's will typically do well with dogs and cats they have been raised with. They are not recommended for homes with other household pets. They are lively and boisterous yet sensitive. The Boxerdoodle will generally be a capable watchdog that will alert their family to visitors or out of the ordinary sounds. Depending on coat type, the Boxerdoodle requires regular brushing or professional clipping. Bathing should only be done when necessary using a mild shampoo. They may be prone to such health issues as hip dysplasia, epilepsy, allergies, skin problems, and PRA. The coat of the Boxerdoodle may have a very curly coat, a coat of long, wavy fur, or a coat that is short and dense. Early socialization and obedience is recommended. The Boxerdoodle may be sensitive and stubborn. However, they are intelligent. The Boxerdoodle will not respond to harsh or heavy-handed methods. Training must be done with firmness, fairness, patience, and consistency. The Boxerdoodle will do okay in an apartment provided they are sufficiently exercised. They are highly energetic and require daily securely leashed walks, family play sessions, and off-lead play time in a securely fenced yard.